We will be closed over the easter bank holiday and re-open on Tuesday 23rd April. Any orders placed over the holiday period will be dealt with on our return. Happy Holidays. This is a Corelle Serving Platter - 31cm x 25.25cm from the Garden Country Cottage set. The intricate appealing tableware offers a contemporary look that's simple, yet elegant and coordinates with a range of home décor styles.Corelle brings beauty and durability to your table every day. Corelle is the unique Tableware dinner set that was introduced to the USA and quickly became one of America’s leading brands of everyday dinnerware. Corelle’s popularity has since grown worldwide because it offers a unique combination of good looks and durability, and due to it's resistance to breaking it is especially appealing in busy households with children. 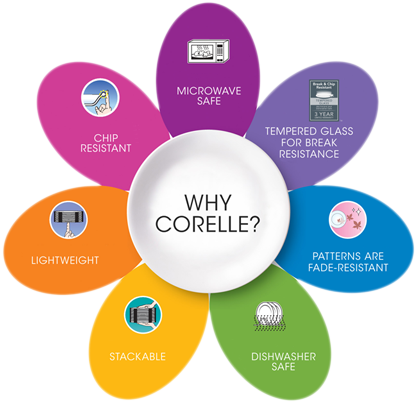 Corelle’s durability is due to its unique sandwich construction which bonds together three layers of special glass materials. The result is lightweight dinnerware that resists breaking, cracking, chipping, and permanent staining. Corelle crockery is also designed for easy handling and compact storage. For kitchens with limited storage, it nests neatly and efficiently. It can also be used to reheat food in the microwave and oven and is dishwasher proof. The special application method in development fuses the patterns into the base glass. The designs are therefore long lasting and will not fade, even after years of use. Sail and Trail Ltd is an independently owned family company. The team of full and part time staff has a wealth of knowledge of the leisure market and is focused on supplying high quality and value for money products to meet the needs of our discerning customers.